Our 4-star-superior family and wellness hotel offers you a whole mountain of possibilities for your perfect holiday with children. The exclusive location of our house at 1,200 meters guarantees a relaxing holiday in the Alps and promises lots of fun for children as well as relaxing days for parents thanks to the large wellness area. Experience the impressive nature of the Allgäu around our hotel and let yourself be surprised by the variety of leisure activities, spacious family rooms and apartments as well as our all-inclusive pampering board. Our unique hotel ensures unforgettable family moments away from everyday life. Relax and take a deep breath, while you know your children are taken care well of us. So get out of your home and jump right into your holiday happiness - let's go to the Allgäuer Berghof! The alpine panorama invites you to regenerate your body and mind. 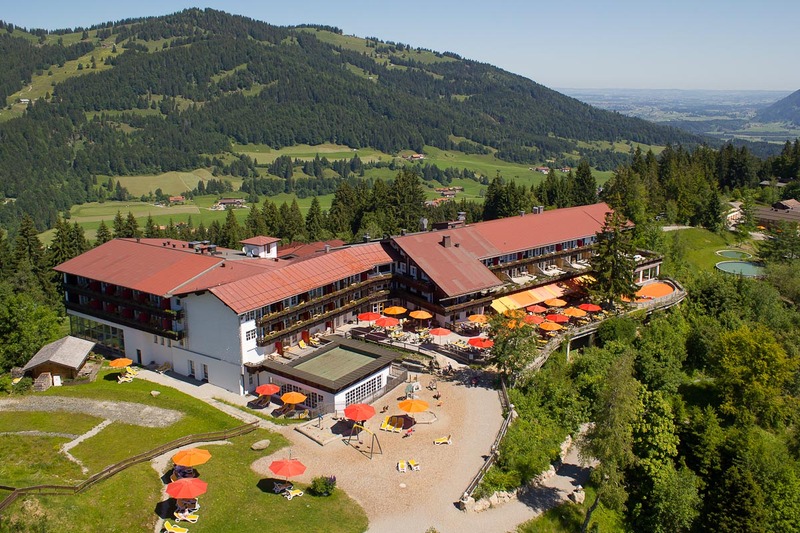 Our family hotel as well as the holiday region Allgäu is a true paradise for all ages. Whether you enjoy exciting outdoor activities or the feeling of pure nature, the uniquely beautiful location of the Allgäuer Berghof makes it possible. The safety of our guests, especially the little ones, has the highest priority. Thanks to Familotel safety standards and regular checks, children can play jauntily and parents can relax unconcernedly. official TÜV seal "OK for Kids"
Those who travel with children, have to think of many things. To give you a relaxed start of your holidays and also that you can travel with "light luggage", there are extensive facilities for babies and toddlers available for free at any time for our guests. Therefore, you have also left enough space in the trunk for even more joyful anticipation of your vacation. baby buffet with breastfeeding tea, baby formula and baby food in jars of "Holle" and "Töpfer-Allgäu"
Our rooms are especially tailored to the needs of families. Spacious and with enough storage space, they provide the necessary feel-good atmosphere for the whole family. Each room at the Berghof is furnished with individual features and attention to detail. With our loving child care and a comprehensive game, sports and adventure program it is ensured, that boredom even on rainy days has no chance. Whether infants, toddlers, pupils or teenagers - the age-appropriate care, play accompaniment and leisure activities by our experienced, first-class trained employees is guaranteed in the family and wellness hotel in the Allgäu. This is how children have fun - and parents have also enough time for themselves! The family-friendly Berghof-Spa spoils both body and soul. In every season, the well-tempered water and the unbelievably beautiful view of the Allgäuer Alps is amazing. Depending on your needs, water fun is guaranteed for the whole family, or relaxed togetherness for parents is given thanks to our loving childcare.